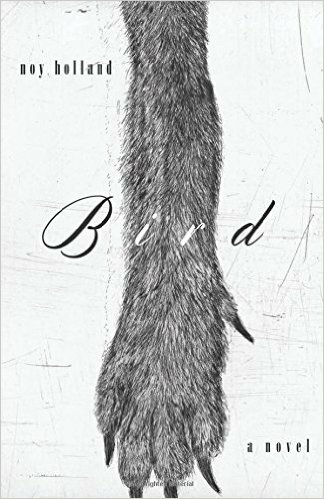 Noy Holland’s Bird is a complex, deeply satisfying debut novel from the hands of a sure, brilliantly disturbing short-story writer. In it, we are invited to inhabit the unappetising life of a once-wild woman who has sunk into destructive maternity. She is haunted by ghosts who echo in the pink folds of her brain: her dead mother, her untameable best friend, and the violent (vividly-alive) former lover who used pain and pleasure as twin goads, sparking her to action. The characters are all sharply, devastatingly drawn — in love and hatred — and the writing style that the author utilises is both eccentric and absolutely perfect for the story. Bird hangs up and sits on the stairs still talking, wondering if it might be true. She might be dying, that is, or only making it up. There is a code she doesn't know, she thinks there must be, a sneaky, menacing tally. She lost seven teeth when she was pregnant — her gums withered, the yellow roots let go. She swallowed a tooth in her sleep one night and thought she had swallowed the baby, thought: I will have to give birth through my head. She needs a bladder tuck — doctor said so. Her bladder sags, it pooches out of her — unmoored and inelastic — any time she stands. So she sits, and tests it with her finger, and of course she thinks baby. But this one will be pelagic and never come to land. She keeps cuttings of Mickey's hair balled up in a drawer somewhere. She keeps the peel of the first orange they shared and a cruddy bloody tissue. Not much. He had demolished everything else: the little clay pot he had made for her, the painting of a silver-toned cloud. He rode her bicycle into the ring er. Mickey burned every letter he had written to her and the box he made to hold them. The note he left said, Forgive me. I talked to your mother while I wrecked that stuff. I don't know why I did. Of course Bird kept it. All Bird's life, she has avoided knowing herself. She has been afraid of failure and pain. She has run from reflection. Now, on this ordinary morning, after a phone call from a friend, she is confronted with it, with the fact of all her failures. They are very painful. This is a process that is both devastating and necessary to watch. The novel is brief, in time-span and pages. It takes place over the course of a day and its sparse-written pages barely add up to a hundred and fifty pages, but the writing is dense, the characters are complex and alive. It feels like a bigger book than it is. It is a larger, deeper book than a great many popular doorstops. I will revisit it often.